The music of ancient Greece was almost universally present in ancient Greek society, from marriages, funerals, and religious ceremonies to theatre, folk music, and the ballad-like reciting of epic poetry. It thus played an integral role in the lives of ancient Greeks. There are significant fragments of actual Greek musical notation as well as many literary references to ancient Greek music, such that some things can be known—or reasonably surmised—about what the music sounded like, the general role of music in society, the economics of music, the importance of a professional caste of musicians, etc. Even archaeological remains reveal an abundance of depictions on ceramics, for example, of music being performed. Concerning the origin of music and musical instruments: the history of music in ancient Greece is so closely interwoven with Greek mythology and legend that it is often difficult to surmise what is historically true and what is myth. The music and music theory of ancient Greece laid the foundation for western music and western music theory, as it would go on to influence the ancient Romans, the early christian church and the medieval composers. Specifically the teachings of the Pythagoreans, Ptolemy, Philodemus, Aristoxenus, Aristides, and Plato compile most of our understanding of ancient Greek music theory, musical systems, and musical ethos. The study of music in ancient Greece was included in the curriculum of great philosophers, Pythagoras in particular believed that music was delegated to the same mathematical laws of harmony as the mechanics of the cosmos, evolving into an idea known as the music of the spheres. The Pythagoreans focused on the mathematics and the acoustical science of sound and music. They developed tuning systems and harmonic principles that focused on simple integers and ratios, laying a foundation for acoustic science; however, this was not the only school of thought in ancient Greece. Aristoxenus, who wrote a number of musicological treatises, for example, studied music with a more empirical tendency. Aristoxenus believed that intervals should be judged by ear instead of mathematical ratios, though Aristoxenus was influenced by Pythagoras and used mathematic terminology and measurements in his research. Music played an integral role in ancient Greek society. Pericles' teacher Damon said, according to Plato in the Republic, "when fundamental modes of music change, the fundamental modes of the state change with them." Music and gymnastics comprised the main divisions in one's schooling. "The word 'music' expressed the entire education". Instrumental music served a religious and entertaining role in ancient Greece as it would often accompany religious events, rituals, and festivals. Music was also used for entertainment when it accompanied drinking-parties or symposia. A popular type of piece to be played while drinking at these drinking parties was the skolion, a piece composed to be heard while drinking. Before and after the Greek drinking parties, religious libations, or the religious the act of partaking and pouring out drink, would be made to deities, usually the Olympic gods, the heroes, and Zeus. The offering of libations were often accompanied by a special libation melody called the spondeion, which was often accompanied by an aulos player. Music occupied an important role in the Greek sacrificial ceremonies. The sarcophagus of Hagia Triada shows that the aulos was present during sacrifices as early as 1300 BC. Music was also present during times of initiation, worship, and religious celebration, playing very integral parts of the sacrificial cults of Apollo and Dionysus. Music (along with intoxication of potions, fasting, and honey) was also integral in preparation and catalyzing divination, as music would often induce prophets into religious ecstasy and revelation, so much so that the expression for "making music" and "prophesying" were identical in ancient Greek. Instruments were also present in war time, though it may not have been considered music entirely. Specific notes of the trumpet were played to dictate commands to soldiers on the battlefield. The aulos and percussion instruments also accompanied the verbal commands given to oarsmen by the boatswain. The instruments were used mainly to help keep the oarsmen in time with one another. Paean: most commonly sung in honor or worship of Apollo as well as Athena, they usually solemnly expressed the hope for deliverance from a peril, or were sung in thanksgiving after a victory or escape. Prosodion: a type of hymn or processional that invoked or praised a god. Prosodions were usually sung on the road to an altar or shrine, and usually preceded or were followed by a paean. Dithyrambs: usually merrily sung in celebration at festivals, performed especially in dedication to Dionysus the god of wine. Dithyrambs featured choirs (choros) of men and boys who were accompanied by an aulos player. Whether or not long narrative poetry, or epic poetry like those of Homer, were sung is not entirely known. As in Plato's dialogue Ion, Socrates uses both the words "sing" and "speak" in connection with the Homeric epics, however there are heavy implications that they maybe have been at least recited unaccompanied by instruments, in a sing-song chant. Music was also present in ancient Greek lyric poetry, which by definition is poetry or a song accompanied by a lyre. Lyric poetry eventually branched into two paths, monodic lyric which were performed by a singular person, and choral lyric which were sung and sometimes danced by a group of people choros. Famous lyric poets include Alkaios and Sappho from the Island of Lesbos, Sappho being one of the few woman who's poetry has been preserved. Music was also heavily prevalent in ancient Greek Drama. In his Poetics, Aristotle links the origins of tragic drama to dithyrambs. The leaders of dithyrambs were the ones who led the song and dance moves, which would then be responded to by the group. Aristotle implies that this relationship between a single person and a group began the tragic drama, which in its earliest stages had a single actor who played all the parts through either song or speech. The single actor engaged in dialogue with the choros. The choros narrated most of the story through song and dance. In ancient Greece, the playwright was expected to not only write the script but also expected to compose the music and dance moves. The ancient Greek myths were never codified or documented into one form; what exists are several different versions from several different authors, across multiple centuries, which can lead to variations and even contradictions among authors and even the same author. According to Greek mythology: music, instruments, and the aural arts are attributed to divine origin, and the art of music was gift of the gods to men. 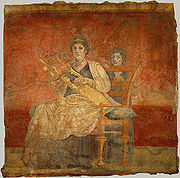 Lyre: According to the Homeric Hymn to Hermes, Hermes, after stealing his brother Apollo's sacred cattle, was inspired to build an instrument out of a tortoise shell, he attached horns, and gut-string, to the shell and invented the first lyre. Afterward Hermes gave his lyre to Apollo, who took interest in the instrument, in payment for the stolen cattle. In other accounts, Hermes gave his newly invented lyre to Amphion, a son of Zeus and a skilled musician. Syrinx/ Pan-pipe: According to Ovid's Metamorpheses, Syrinx was a Naiad, a water nymph, who ran away from Pan after he tried to woo her. While she fled, she came upon an uncrossable river and prayed to her sisters to transform her so that she may escape Pan. Her Nymph sisters transformed Syrinx into a bundle of reeds which Pan found and fashioned an instrument out of, the pan pipe or syrinx. Aulos: According to Pindar's Twelfth Pythian Ode, after Perseus beheaded Medusa, Athena 'found' or 'invented' the aulos in order to reproduce the lamentation of Medusa's sisters. Since the same Greek word is used for 'find' and 'invent', it is unclear; however, the writer Telestes in the 5th century states that Athena found the instrument in a thicket. In Plutarch's essay On the Restraint of Anger, he writes that Athena, after seeing her reflection while playing the aulos, threw the instrument away because it distorted her facial features when played. After which Marsyas a satyr, picked up her aulos and took it up as his own. Orpheus is a significant figure in the ancient Greek mythology of music. Orpheus was a legendary poet and musician, his lineage is unclear as some sources note him as the son of Apollo, the son of the Muse Calliope, or the son of mortal parents. Orpheus was the pupil and brother of Linus. Linus by some accounts is the son of Apollo and the Muse Urania; Linus was the first to be gifted the ability to sing by the Muses, which he passed to Orpheus. Other accounts state that Apollo gave Orpheus a golden lyre and taught him to play, while the muses taught Orpheus to sing. Orpheus was said to be such a skilled musician that he could charm inanimate objects. According to the Argonautica, Orpheus in his adventures with Jason and the Argonauts, was able to play music more beautiful and louder than the bewitching sirens, allowing the Argonauts to travel safely without being charmed by the sirens.When Orpheus' wife, Eurydice, died, he played a song so mournful that it caused the gods and all the nymphs to weep. Orpheus was then able to travel to the underworld, and with music, softened the heart of Hades enough that he was allowed to return with his wife; however, under the condition that he must not set eyes upon his wife until they finished their travel out of the underworld. Orpheus was unable to fulfill this condition and tragically, his wife vanished forever. According to Apollodorus in Bibliotheca, Marsyas the Phrygian satyr once boasted of his skills in the aulos, a musical contest between Marsyas and Apollo was then conducted, where the victor could do "whatever they wanted" to the loser. Marsyas played his aulos so wildly that everyone burst into dance, while Apollo played his lyre so beautifully that everyone cried. The first round was judged, by the muses, to be a draw. According to one account, Apollo then played his lyre upside down, which Marsyas could not do with the aulos. In another account Apollo sang beautifully, which Marsyas could not do. In another account, Marsyas played out of tune and accepted defeat. In all accounts, Apollo then flayed Marsyas alive for losing. Pindar recounts a similar myth but instead of Marsyas, it was Pan who contests Apollo and the judge was Midas. This myth can be considered a testament of Apollo's skill but also a myth of caution towards pride. the salpinx was a brass trumpet used for military calls, and even contested in the Olympics. A number of sources mention this metal instrument with a bone mouthpiece. The lyre, kithara, aulos, hydraulis, and salpinx all found their way into the music of ancient Rome. The tympanum or tympanon, a type of frame drum or tambourine. It was circular, shallow, and beaten with the palm of the hand or a stick. Crotala, a kind of clapper or castanet used in religious dances by groups. Koudounia, bell-like instruments made of copper. The enigmatic ancient Greek figure of Pythagoras with mathematical devotion laid the foundations of our knowledge of the study of harmonics—how strings and columns of air vibrate, how they produce overtones, how the overtones are related arithmetically to one another, etc. It was common to hear of the "music of the spheres" from the Pythagoreans. Plato's Republic notes that Greek musicians sometimes played more than one note at a time, although this was apparently considered an advanced technique. The Orestes fragment of Euripides seems to clearly call for more than one note to be sounded at once. Research in the field of music from the ancient Mediterranean—decipherings of cuneiform music script—argue for the sounding of different pitches simultaneously and for the theoretical recognition of a "scale" many centuries before the Greeks learned to write, which they would have done before they developed their system for notating music and recorded the written evidence for simultaneous tones. All we can say from the available evidence is that, while Greek musicians clearly employed the technique of sounding more than one note at the same time, the most basic, common texture of Greek music was monophonic. ^ Ulrich and Pisk, p. 16. ^ Bélis, Annie (2001). Aristoxenus. Oxford Music Online. 1. Oxford University Press. doi:10.1093/gmo/9781561592630.article.01248. ^ Edmond Pottier (1908). Douris and the Painters of Greek Vases. p. 78. ^ Katz, Israel J. (2001). Sendrey [Szendrei], Alfred. Oxford Music Online. 1. Oxford University Press. doi:10.1093/gmo/9781561592630.article.25401. ^ Johannes Quasten (1983). Music and Worship in Pagan and Christian Antiquity. NPM Studies in Church Music and Liturgy. Translated by Boniface Ramsay, O.P. Washington, D.C.: National Association of Pastoral Musicians. p. [page needed]. ^ Bussanich, John (2018-01-18). Plato and yoga. Edinburgh University Press. doi:10.3366/edinburgh/9781474410991.003.0007. ISBN 9781474410991. ^ Ulrich and Pisk, p. 15. ^ Richardson, Nicholas (2010-04-22). Three Homeric Hymns. Cambridge University Press. doi:10.1017/cbo9780511840296. ISBN 9780521451581. ^ Jones, Peter (2007). Glossary of technical literary terms. Reading Ovid. pp. 17–18. doi:10.1017/cbo9780511814198.003. ISBN 9780521849012. ^ Robertson, Noel; Bowra, C. M. (1970). "The Odes of Pindar. With an Introduction". The Classical World. 63 (9): 303. doi:10.2307/4347215. ISSN 0009-8418. JSTOR 4347215. ^ Depew, Mary (2010-05-20). "Book Review: Anatole Mori, The Politics of Apollonius Rhodius' Argonautica (Cambridge: Cambridge University Press, 2008), 260 pp". International Journal of the Classical Tradition. 17 (2): 292–295. doi:10.1007/s12138-010-0193-4. ISSN 1073-0508. ^ Landels, John G (1999). Music in Ancient Greece and Rome. Abingdon, UK: Taylor & Francis. p. [page needed]. doi:10.4324/9780203270509. ISBN 978-0-203-27050-9. ^ Waterfield, R (1996-01-01). "A. Nehamas, P. Woodruff (tr. ): Plato: Phaedrus. Translated, with Introduction and Notes. Indianapolis: Hackett Publishing Co., Inc., 1995". The Classical Review. 46 (1): 10–11. doi:10.1093/cr/46.1.10. ISSN 0009-840X. ^ Reiner, Paula; Ruck, Carl A. P.; Staples, Danny (1996). "The World of Classical Myth: Gods and Goddesses, Heroines and Heroes". The Classical World. 90 (1): 73. doi:10.2307/4351918. ISSN 0009-8418. JSTOR 4351918. ^ In the Politics (1341a), Aristotle describes the kithara as an organon technikon, or an artist's instrument, requiring training. ^ Plato, Laws 700-701a. cited in Wellesz, p. 395. ^ Plato, Republic, cited in Strunk, pp. 4-12. ^ Plato, Laws 812d., cited in Henderson, p. 338. Aristotle, and S. H. Butcher. Aristotle's poetics. New York: Hill and Wang, 1961. Print. Landels, John G. (1999). Music in Ancient Greece and Rome. London and New York: Routledge. ISBN 978-0-203-27050-9. Ovid (1989). Ovid's Metamorphoses. Dallas, Texas: Spring Publications. Pindar (1969). The Odes of Pindar, edited and translated by C. M. Bowra. Harmondsworth: Penguin. Quasten, Johannes (1983). Music and Worship in Pagan and Christian Antiquity. Washington, D.C: National Association of Pastoral Musicians. Richardson, N. J. (2010). Three Homeric Hymns: To Apollo, Hermes, and Aphrodite : Hymns 3, 4, and 5. Cambridge, UK: Cambridge University Press. Sendrey, Alfred (1974). Music in the Social and Religious Life of Antiquity. Rutherford N.J: Fairleigh Dickinson University. Trehub, Sandra (2000). "Human Processing Predispositions and Musical Universals". In The Origins of Music, edited by Nils L. Wallin, Björn Merker, and Steven Brown,[page needed]. Cambridge MA: MIT Press. Ruck, Carl A.P. and Danny Staples, The World of Classical Myth (Carolina Academic Press) 1994. Detail from Piero di Cosimo's 16th-century version of Perseus rescuing Andromeda. The instrument in the hands of the musician is an anachronism and appears to be an imaginary combination of a plucked string instrument and bassoon. Anderson, Warren D. (1966). Ethos and Education in Greek Music: The Evidence of Poetry and Philosophy. Cambridge, Massachusetts: Harvard University Press. Barker, Andrew (2007). The Science of Harmonics in Classical Greece. Cambridge and New York: Cambridge University Press. ISBN 9780521879514. Bundrick, Sheramy (2005). Music and Image in Classical Athens. Cambridge University Press. Comotti, Giovanni (1989). Music in Greek and Roman Culture. Baltimore: Johns Hopkins University Press. ISBN 0-8018-3364-7. Hagel, Stefan (2009). Ancient Greek Music: A New Technical History. Cambridge and New York: Cambridge University Press. ISBN 978-0-521-51764-5. Kramarz, Andreas (2016). The Power and Value of Music. Its Effect and Ethos in Classical Authors and Contemporary Music Theory. New York/Bern: Peter Lang Publishing. ISBN 9781433133787. LeVen, Pauline A. (2014). The Many-Headed Muse. Tradition and Innovation in Late Classical Greek Lyric Poetry. Cambridge and New York: Cambridge University Press. ISBN 9781107018532. Power, Timothy (2010). The Culture of Kitharôidia (Hellenic Studies: 15). Cambridge, Massachusetts, and London, England: Center for Hellenic Studies, Trustees for Harvard University. ISBN 9780674021389. Sachs, Curt (1943). The Rise of Music in the Ancient World. NY: W.W. Norton & Company, Inc.
Plato. The Symposium. Trans. Alexander Nehamas and Pay Woodruff. Indianapolis: Hackett Publishing Company, 1989. Print. Apollonius, Rhodius. The Argonautica.Cambridge, Mass. : London :Harvard University Press; W. Heinemann, 1961. Print. This page was last edited on 2 April 2019, at 14:19 (UTC).